We had a 7-person panel including Ben Mandel of Mayor DeBlasio's Office of Sustainability, John Voelcker of Green Car Reports, Zach Kahn of BYD, Seth Weintraub of Electrek.Co , John Shipman and Sherry Login of Con Ed and Judah Aber of EB Start. 45 people signed post cards to Governor Cuomo urging him to direct VW Settlement funds to electric school buses and transit buses vehicles and to expand charging to ALL communities, including low income communities and communities with multi-uni dwellings. NYC Dept of Transportation co-sponsored the event. About 8 NYC Sierra Club volunteers worked on the event. 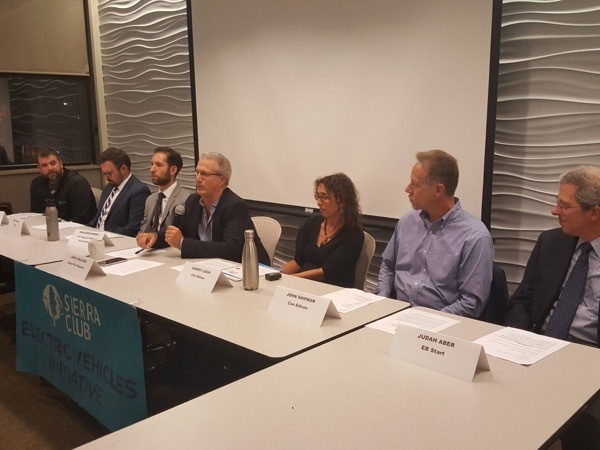 The Sierra Club's Electric Vehicle Initiative in NY partnered with the local NYC Sierra Club to expand their monthly lecture series for National Drive Electric Week. This Electric Vehicle Panel Discussion will explore the expansion of Electric Vehicles in NYC. This panel discussion will include segments on electric buses, electric trucks, electric cars and related federal, state and local NYC policies that accelerate Electric Vehicle adoption. **IMPORTANT NOTE FOR EV DRIVERS** - Due to VERY limited street parking on East 15th Street, just a few Electric Vehicles of high interest will be displayed on E 15th Street starting at 6PM, including a BMWi3, a Chevy Bolt, a Tesla Model X and 40' BYD Zero Emission Bus. Others will have to find parking independently. Panelists will include: Zachary Kahn, Director of Government Relations - North America / Director of Business Development - NYC; John Voelcker, Editor of Green Car Reports; Benjamin Mandel, Renewable Energy Policy Advisor, NYC Mayor's Office of Sustainability; Judah Aber, Co-Founder EB Start Consulting. Additional confirmations are forthcoming. Registered attendees report 295,550 electric miles driven.